Our tree removal and tree care professionals are committed to answering all of your questions. Below, you’ll find a condensed list of frequently asked questions. If your question has not been addressed below, please feel free to call us directly for a detailed response. Contact the tree service Waukesha and the rest of Southeastern Wisconsin relies on for high quality, affordable tree care. Q: What are signs of disease in trees? Q: What are signs of insect infestation in trees? Q: What are common tree diseases in Wisconsin? Q: What are the most common insects causing infestations in Wisconsin trees? Q: Do You Provide Local Emergency Storm Tree Damage Service in Waukesha? Q: How do I know your tree service technicians are qualified and capable to handle my Milwaukee tree removal needs? Q: Are your Milwaukee tree service professionals licensed and insured? Q: Can your Milwaukee tree removal company get rid of large trees on my property? Q: Can your certified arborists treat my Emerald Ash Borer problem? Q: What options does your Milwaukee tree service offer? Q: What areas does your Wisconsin tree service company cater to? A: What are signs of disease in trees? The exact symptoms will change based on the disease your tree has. Ask our experts for help identifying disease in your trees. A: What are signs of insect infestation in trees? These are just a few of the most common signs of tree infestation. Contact our certified arborists to check if your tree had an insect problem. A: What are common tree diseases in Wisconsin? Common tree diseases in Wisconsin are: Oak Wilt, Dothistroma Needle Blight, Beech Bark Disease, and Fungus and mold. Russ’s Tree Service provides professional tree treatment. 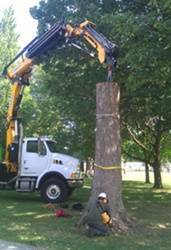 Our certified arborists do everything possible to save diseased trees. If a tree is too far along or already dead, we offer dead tree removal and stump grinding. Just cutting down the tree isn’t enough, as the remaining roots can spread the infection to the healthy trees on your property. A: What are the most common insects causing infestations in Wisconsin trees? Insects known for causing tree infestations include: Emerald Ash Borer, Gypsy Moths, Silver Maple Beetles and Asian Longhorned Beetles. An infestation caused by any of these insects can lead to the death of your trees. Schedule a tree care and treatment appointment with Russ’s Tree Service to find the best option for ending your insect issue. A: Do You Provide Local Emergency Storm Tree Damage Service in Waukesha? Yes! Our Certified Arborists provide 24 hour emergency storm damage tree service in Waukesha and throughout Southeast Wisconsin. We offer local tree removal services, branch removal, stump removal and stump grinding. We use specialized equipment to avoid any damage to your lawn, and we do a thorough clean up before leaving your property. Contact our Milwaukee tree service company now for fast, affordable, 24-hour emergency tree service. A: How do I know your tree service technicians are qualified and capable to handle my Milwaukee tree removal needs? Our Waukesha tree service specialists are certified arborists and degreed professionals. We specialize in all facets of tree service. Years of industry experience and a highly skilled workforce make us the tree service Wisconsin turns to first. A: Are your Milwaukee tree service professionals licensed and insured? Yes. Our experienced Milwaukee tree service technicians are licensed and insured. Insurance is vital to a professional tree service company in Wisconsin. Insurance protects our workers and gives you peace of mind knowing you are dealing with an experienced and reputable tree service company. Trust us with all your Wisconsin tree care needs. A: Can your Milwaukee tree removal company get rid of large trees on my property? Absolutely! We employ a team of highly trained Milwaukee tree removal climbers to take trees down one section at a time, minimizing risk to people and property. Our experienced crane operators work cooperatively with our climbers to attach sections of the tree to the crane, then cut and lower the section safely. Our highly skilled staff and years of experience are just a couple reasons why we provide the best tree service Milwaukee has to offer. A: Can your certified arborists treat my Emerald Ash Borer problem? Yes! Our certified Milwaukee arborists are able to quickly identify Wisconsin Emerald Ash Borer (EAB) invasions. We know how to properly treat Wisconsin EAB and other invasive species with long-term results. A: What options does your Milwaukee tree service offer? We offer a wide range of tree removal and tree trimming services throughout Southeastern Wisconsin. Our services include Milwaukee tree removal, tree trimming, pruning and maintenance, land clearing, stump grinding, stump removal, storm damage repair, emergency tree removal, Wisconsin kiln dried firewood delivery and pickup, and land clearance. A: What areas does your Wisconsin tree service company cater to? Our tree services are available throughout Southeastern Wisconsin; however, we operate primarily in Milwaukee, Waukesha, and Racine counties.